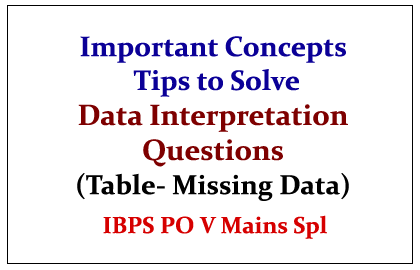 Dear Readers,Based on our IBPS PO V Mains Exam-Preparation Time Table (which we have already published), today we have given the Important Tips to Solve the Data Interpretation (Table-Missing Data Type) Questions in Aptitude Section. Candidates those who are preparing for the examination can also download this in PDF. Directions ( 1 – 6) :Read the following table carefully and answer the questions given below it. Data related to number of employees who joined (Jo) and left (Le) five given companiesA,B,C,DandE during the given years. 1. If the respective ratio of number of male and female employees inCompanyB at the end of 2013 was 5 : 6, what was the number of female employees inComnpanyB at the end of 2013 ? 2.What was the total number of employees inCompanyA at the end of 2014 ? 3. Number of employees inCompanyE at the end of 2012 is what percent more then the number of employees inCompanyC at the end of 2012 ? 4. In which of the given companies, the number of employees was highest at the end of 2012 ? 5. What is the average number of employees who joinedCompanyD during all the given years taken together? 6. What is the respective ratio between total number of employees who joinedCompanyCin 2013 and 2014 together and total number of employees who left Company E in 2013, 2014 and 2015 together ? · In 5 Companies Number Of Employees are Joined (Jo) and Left (Le) during the givenyears. 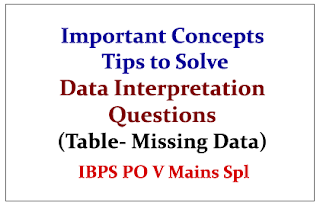 Data interpretationMissing data tabular form. STEP 1: The Number of employees inCompanyA at the end of 2014 => Add Joined Employees from 2011 to 2014(because question they mentioned end of 2014) – Add Left of Employees from 2011 to 2014. = (161 + 148 + 135 + 112) – (58 + 69 + 88) = 556 – 215 = 341.